Many seniors rely on medications for treating chronic medical conditions and maintaining optimal health. However, taking multiple medications simultaneously can cause confusion, which can lead to missed dosages and potentially dangerous drug interactions. And if seniors live alone, there is no one there to help them keep everything on the proper schedule. A monitored automatic pill dispenser from Towne Monitoring Service can eliminate the hassles and worries from the medication administration process. 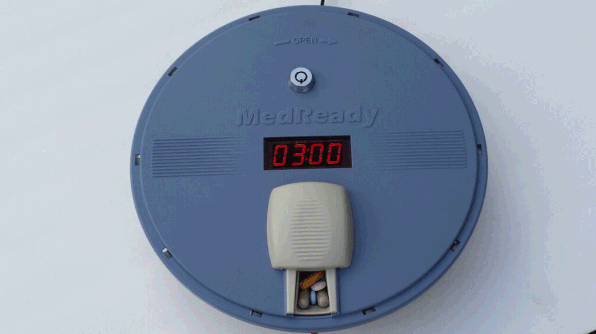 Our MedReady product is a timed-alarm system that alerts the senior when it’s time to take a scheduled dosage. The dispenser can hold up to 28 doses and can be programmed to deliver one to four doses per day. Each dispenser compartment can hold as many as nine pills the size of an M&M candy piece. How Does the Monitored Medication Dispenser Work? When it’s time to take a pill, the device uses an audible alarm and a flashing light to notify the patient. The patient then opens the medication door (which also disables the alarm and light), takes the pill from the dispenser and closes the door. Our Medready products come in both landline and cellular versions, a version that integrates directly with our MXD PERS units, as well an unmonitored timed dispenser model. While the basic function remains the same with all four versions, there are certain advantages/disadvantages to each that we would be more than happy to discuss with you. The stored medication remains under lock and key, which makes the dispenser 100% tamper-resistant. What Are the Benefits of a Monitored Medication Dispenser Equipped With Cellular Technology? Because MedReady operates via a cellular network, there is no need for a landline phone hookup or internet connection. Users can alter alarm schedules and dosage amounts and manage all device settings remotely via smartphone or tablet. Patients and caregivers can receive instant text notifications if a scheduled dose is missed or forgotten. Our well-trained operators can also provide around-the-clock monitoring if desired. You can integrate our automated pill device for seniors with our personal emergency response systems to create an even safer home environment for seniors who live alone. Our PERS devices enable the individual to reach out for help simply by pressing a button. Our trained operators will receive an instant alert and perform a full, fast assessment of the situation. If necessary, we’ll notify the local EMS so they can promptly dispatch first responders to the home. 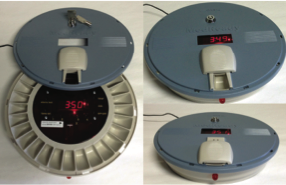 Why Make Towne Monitoring Service Your Choice for a Monitored Automatic Pill Dispenser? Located in Souderton, Pennsylvania, Towne has more than 65 years of experience providing high-quality products and services for our customers. Our mission is to be the preferred supplier of tracking, answering and monitoring services based on our commitment to providing customized solutions, proactive customer service and unmatched value. We achieve this by providing a seamless integration of people and technology. If a monitored automatic pill dispenser from Towne Monitoring Service makes sense for you or someone you love, give us a call at 215-703-6450 today.